What do you do when you want a coffee but don’t know where to go? Ask someone. I found a new coffee spot I like, French Truck Coffee. It’s a two-block walk from the SGI-USA Community Center, although there are multiple locations. Boy, I’m glad I asked! Here’s another post about coffee–good coffee. If you’re like BF and don’t drink it, well, pass it along to someone who does. Especially if they’re heading to New Orleans anytime soon. Oh, and to make matters worse, he also wouldn’t try cauliflower rice I’d made with it. I blitzed up a whole, organic cauliflower in a food processor, and cooked it in a big cast iron skillet with butter, olive oil and the Paula Deen House Seasoning I make and keep around–delicious. Nope–wouldn’t touch it, even after telling me, “I’ll try anything you make.” I reminded him of this, and he was undeterred. He barely ate the Knorr “four cheese risotto” from a package that isn’t a real risotto, because it doesn’t have arborio rice. (I’ve made risotto before.) I called it “cheesy rice,” and the dogs ate most of it. After that incident, I haven’t cooked anything for him since. Nada. Nuffin’. He ate a bowl of cereal last night, and has cooked food once. Last time he made “red beans and rice,” with red beans from cans, I took a taste and was unimpressed. (I will eat it occasionally, just to be nice, and he puts sausage in it.) When he wasn’t looking, I grabbed that bottle of Tabasco Sriracha Sauce from the pantry, opened it, and went once around the pot. Mixed it in really well. It was about a tablespoon, I think, in that big pot. Now THAT tasted good! I know, I know. . .but I’m on strike for a while, darnit. Another place is Orleans Coffee, where I’ve ordered delicious flavored decaf coffee from many times while I lived in Texas. (Because decaf chocolate raspberry is hard to find.) They used to have a little cafe in the Quarter, but after Katrina and all that, they now have two cafes, and I don’t know where they are. Well, I found another one, and I was able to visit again before the April activity. When I go to New Orleans for a Buddhist activity, I leave as early as I can, at least 90 minutes before I want to be there. That way, if there’s traffic, or a diversion, I have time. Sometimes I hit Trader Joe’s for non-perishable items before the meeting, then head elsewhere after the meeting. For the November activity, the E Man told me to do my shopping afterwards this particular Sunday, not before. The Saints were having a game, and some kind of tailgating thing, so it would be better to get there early and shop later. I get off the freeway at the St. Charles exit, and I’m more than an hour early. Driving a little on St. Charles in a half-ton pickup is a bit of a pain (I miss my Saturn.) So I park it and ask one of the guys outside where to get a coffee. Known as “Soka Group,” they’re the guys that hang around outside and help with traffic management and getting people inside safely. Since it was looking like rain this particular day, they’re armed with umbrellas. I did ask about the “Yankee Apple Hand Pies” in the bottom left of that picture, and asked if they had many Yankees come in. He didn’t know, and I said, “Well, we can’t get rid of the Yankees in Texas.” No comment. . . . This is a coffee bag that they framed. Love it! They were busy that Sunday, and so I had a wait while I watched them go at it behind the counter. When they called my name and handed me that coffee. . .mmmmmm. . .oh, yes, definitely worth it. Freshly roasted coffee, freshly brewed. 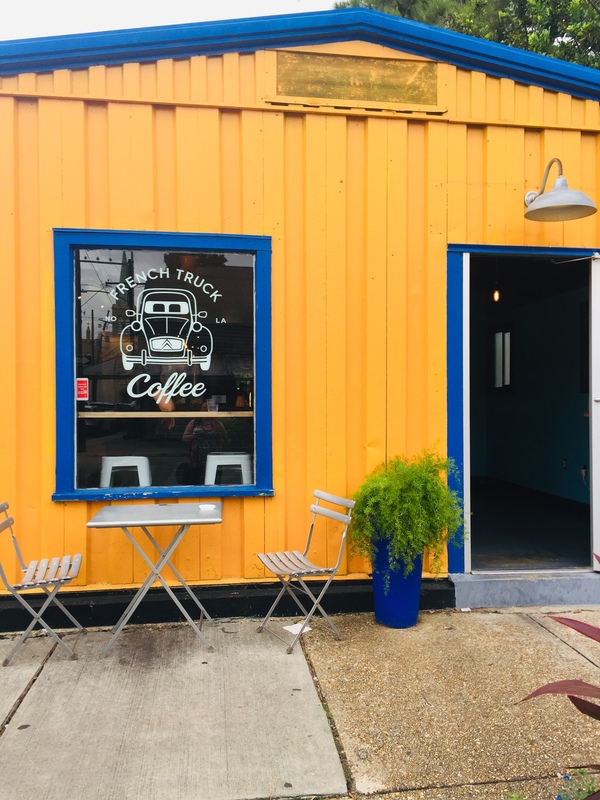 French Truck Coffee has six locations, including two on Magazine Street, with two more coming. They also sell their delicious coffees in local grocery stores like Rouse’s. What? You’re not near a Rouse’s? You can order it, too. They also have a page so you can learn to brew your coffee at home. The company is all about freshly roasted coffee, as the founder describes here on their web page. Honestly, it’s what Starbucks wishes it could be, or maybe used to be. French Truck Coffee is smooth and delicious. I haven’t bought any in the store yet, but that may happen soon if I can find the decaf. If you’re planning a trip to the Crescent City, find one of these. You won’t be sorry. When I went before the April meeting. . .there was a big chicken walking around Erato Street. At 9:00 am. A CHICKEN in the middle of the street. I hope the owner found it before someone with a pot did. I lost track of The E Man, and so I tried to get into Trader Joe’s. No parking available! Well, I ended up getting everything I needed across the street at the huge Rouse’s on Veterans. As I hopped onto I-10 West, I was just listening to my music and driving. Until I got outside of Kenner, past the airport, on my way to I-55. . .and I saw that I-10 East was backed up. WAY Up. Like, way past the I-55 exit backed up. Anytime The E Man tells me what to avoid, I generally listen. Boy was he right. Thanks, Dude! Both are used in the pot and in the iced coffee maker. And on a recent morning when we found ourselves with no power, I packed up my laptop and spent most of the day working at the local PJ’s, where they had Internet. Well, they were very nice, and I drank some coffee and had a yogurt parfait. I’ve done this on many occasions at the Hammond Starbucks, where they are also very nice. Before we had Internet, and BF was sent to another work location, I got on Google Maps and found the closest Starbucks. Most were within 2 miles of his work place. I drank fresh coffee all day, worked in a new place, and we were both happy. Additionally, PJ’s also offers military and veterans discounts. So now BF likes PJ’s even more, and he likes some of the tasty things they have there. He still won’t try coffee, but he now sees that there is nothing bad about him going into a coffee shop. They have things even he might even enjoy! This weekend is the “bunny holiday,” also known as Easter. Yes, I know what Easter is really all about, but popular media simply shows us bunnies and chocolate. If there is a chocolate bunny made with sugar-free chocolate, I’ll indulge, but I’m sure my chocolate will be the regular sugar-free stuff. We may go visit BF’s father, maybe not. The Goddess of the Slow Cooker, Stephanie O’Dea, sent out an email last week offering Easter recipes for the slow cooker. And why not? For all you Texans, know that HEB will be closed. . .but I think Kroger may be open. Whatever you do, have a great holiday weekend.